From our shop you can rent boards to take to any nearby lake, book a lesson for nearby Fetcher Pond, the Yampa River, or the Colorado River; or shop all the latest and greatest deals on paddleboards and gear. Enjoy a cruise down the Yampa Core Trail, paddleboard in tow. Stop for picnic or enjoy a beverage at local restaurant before or after some time paddling at Fetcher Pond. You could also cruise to a put-in on the Yampa and we'll arrange shuttle to get you and the bikes and boards. You'll be the talk of town cruising in style with this bike + trailer + board setup! When the sun sets, your adventures don't have to end. 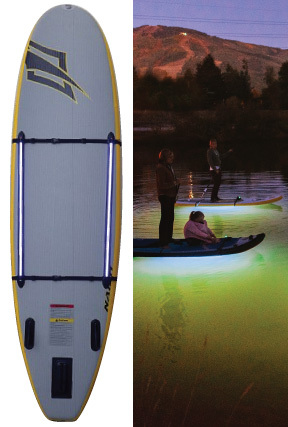 Strap these glow lights to the bottom of your board andexperience the water at night as it comes to life. Tranquility and magic underneath – friends and night skies above.